For this article we’ll focus on dry foods. There are many reasons why you might put your dogs onto a grain free diet. Your dog may have intolerance's to certain grains or you may wish to feed a diet that closely matches what they would eat in the wild. Another reason could be that your dog has diabetes and you are looking to feed a healthier diet that’s low in carbohydrate. There are a few things to look out for and consider. Many dog foods may not have grains listed on the front of the bag but they might be present in the bag. It’s always worth reading the composition to make sure. For example, in ‘Harringtons rich in Salmon and Potato’ the first ingredient is ‘Maize’ making it the most abundant ingredient. It also contains ‘Rice’ and ‘Barley’. In dry dog foods starchy carbohydrates are needed to make the kibble hold together. There are some grain free foods which have simply had the grain replaced with potato. While you may think this is perfectly acceptable its worth noting that potatoes have a high Glycemic Index (GI). Glycemix Index is a measure of how carbohydrates affect blood sugar. Not ideal if your dog suffers from diabetes. Lentils and Chickpeas have a low GI, sweet potatoes, oats and brown rice have a mid GI whereas white rice, corn and potatoes have a high GI. Dry dog foods with a low meat content tend to be high in carbohydrates from grains or potato. As the meat content goes up the carbohydrate content must go down. High amounts of carbohydrates offer little or no nutritional value to your dog so must be considered as a filler. Brown rice does have nutritional value and is full of healthy nutrients. White rice on the other hand is little more than an empty calorie. Are grain free foods appropriate? Think about this: If your dog went into a wheat field it wouldn’t be interested in eating the wheat but it would be interested in the rabbit running around in the field. We believe dogs have adapted to survive on a diet containing grain and potato but they haven't evolved to. Their digestive system is the same as a wolf. If they had evolved their digestive system would have changed. So, when looking for a grain free food what do we recommend? Don’t look for Grain Free. Sounds strange but it’s worth considering foods with low amounts of oats or brown rice as they have a lower GI than potatoes. Many grain free foods don’t shout about it on their packaging. Look for a food that’s high in animal ingredients. 40% + is good. Check the food is potato free. Sweet potato is ok.
Give some thought to the quality of the meat. Orijen and Acana do some very good low GI and grain free foods with very high quality meat. 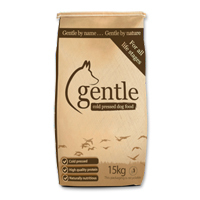 Gentle uses very high quality ingredients and contains brown rice. Visit us on at Taylors Petfoods, Station Road, Attleborough to chat with us about your dogs diet..